If you’re a frequent traveler, you know that there are modern-day airline luggage rules you need to comply by. Getting the right sized bags and meeting weight restrictions will help you avoid any extra fees and travel with ease whenever you fly international. This bag is one of the best carry-on luggage for international travel since it makes up for size with volume. 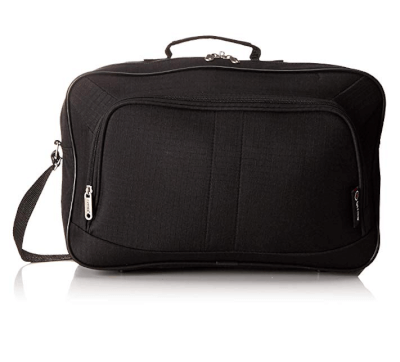 Samsonite gives the perfect bag for heavy-duty carriage while being on the plane. With the inconvenience of noticeably bulky hand carriage on the plane comes the convenience of Samsonite in a 9” high and 13” wheeled solution. Samsonite makes the most of tight spaces by creating a body similar to a duffel bag but sturdy enough to handle turbulence and occasional kicking. This carry-on bag has padding in the interior to soften the ride for anything placed on the inside. It is a light bag on its own, meaning any weight you may feel is only the stored contents. Traveling with it is made easier with an adjustable handle made to reach your arm’s length comfortably. It is simplistic in design, with two side pockets, all pockets being zippered. Duffel bags may not be your first resort when looking for carry-on bags, but what makes this one of the best carry-on luggage options is the vast space it offers you to pack your things. This bag is a heavy duty one, with sturdy and firm stitching to ensure that even your bulkiest, most delicate cargo can make the trip. It comes with two straps for your convenience if you prefer the shoulder and for simply holding it by your side. Duffel bags are always great for trips where you need to carry a lot on you. An example would be traveling on longer flights with family or friends. You would definitely want some entertainment on you along with other necessities throughout the flight. Provided with the bag is a padlock to keep your property private from any unwanted persons invading it. The bag strap can be readjusted to wrap around the bag when not in use for further convenience. 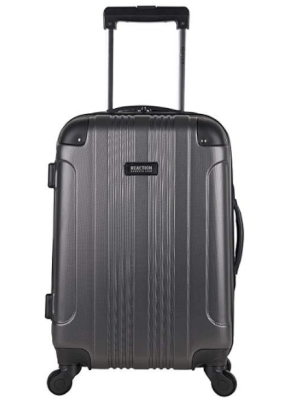 Kenneth Cole has made one of the best carry-on luggage for international travel by following up on the trend of hard shell baggage. With hard skin on your side, you can travel with delicate cargo or electronics without the hassle of fastening them for the flight. 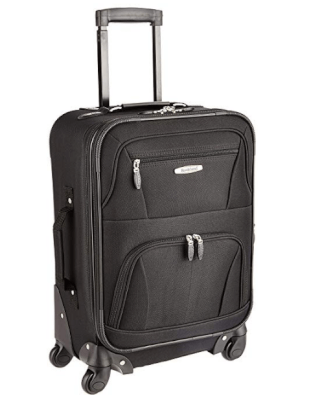 This luggage has the much appreciated option of 360o spinning wheels for turns over any surface. With wheels like these, navigating will be a breeze. Inside there is one large pocket for storage with a restraint strap for clothing or other objects alike. There is also an additional zipper pocket for anything you need stored in a snugger spot. To make up for any troubles you may experience with this baggage, it is backed with a 10-year limited warranty. It has an adjustable handle for easier carriage when travelling. Girls’ night can go anywhere now and still keep up with the chic fashion when carrying this bag. Keeping things simple but still stylish, Bluboon gives a great bag to hand carry all of your basic requirements when going out or long fun trips. It is also ideal for any short trips you may have in mind, capable of fitting a lot more than just a makeup kit. Measuring 16.2 x 14.5 x 8 inches, it can even carry a laptop with plenty of space to spare. The skin isn’t hard, so there is even room for some stretching. There is a back sleeve in the back, so you can slip it over other rolling handles while you travel. When not in use for travelling, it is simple enough a design to even carry around on a daily basis. Make use of a styled bag such as this one by turning everyday into a fashionable day. This makes it one of the truly best carry-on luggage options out there. This bag imitates a duffle bag style while still offering the luxury of an adjustable handle to suit your relaxed arm position. It offers more than enough storage with its wide shape and open design. On its own this bag is a very lightweight piece to travel with. 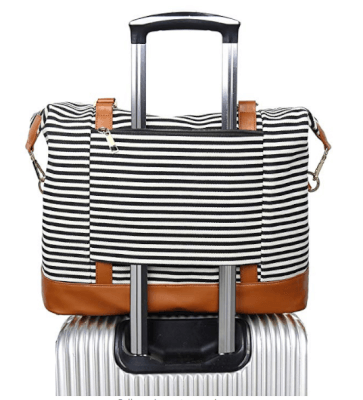 It makes for one of the best carry-on luggage for international travel due to its luxurious style and design that makes for an appealingly cozy look. It also comes with wheels on the bottom so dragging it behind you is less of a chore than lugging it over your shoulder. The interior is well padded so anything breakable or valuable contained inside will be safe during travel. It comes covered with pockets so you can better organize all of your belongings. With two front zipper pockets, one side pocket with a zipper and another netted one, last minute packing is covered. There are also inner pockets to help you properly set your things. Olympia offers one of the best carry-on luggage for international travel with this hard shell 4 wheeler. Topped with a high quality locking handle working along with four 360o spinning wheels, this bag can maneuver by your side flawlessly. Though this bag has a solid exterior build, the interior is quite flexible. With multiple dividers, mesh pockets and buckles, you can orderly pack your belongings with assurance that nothing is going to fly around on your flight. Any delicate and vulnerable belongings will stay safe inside of the padded interior. The carry-on model even has a hidden compartment feature perfect for storing anything the same size as or smaller than a laptop. Not located inside of the main pocket, anything you need to retrieve during the flight can easily go into the hidden compartment. Rockland makes it on the list for the best carry-on luggage for international travel with its expandable body and rectangular shape. Rectangular shapes are always the best for baggage since you can remotely fit more and have space to push and shove other items. With outer pockets and interior dividers to help you orderly position your items, this bag can hold a very promising quantity. Rockland also has an expandable material as its body coverage rather than a stiff skin, meaning there is more space to stuff items such as clothes. It has a strong retractable handle that locks when taken out for easier control as it wheels along behind you. Amazon comes to the rescue with its very own best carry-on luggage for international travel sized perfectly for the heavy duty packer on light, short trips. It promises to fit inside overhead compartments and all underseat storages when on the airplane. Its cubicle build offers vast amounts of space doubled with easy to access side and front pockets. It comes with both wheels and an adjustable handle to seal of the deal as a handy helpful bag to carry with you. Amazon does not disappoint with its one year warranty for the bag in case of any dissatisfied customers. With interior pockets and the secondary handle for easier hoisting of the bag, this ends off as a very good deal. The Right Fit:Airlines have different maximums but most require that the carry-on piece is standardized to 22 x 14 x 9 inches. That means finding a piece that doesn’t measure any more than these dimensions once packed. If you choose a piece with hard sides, it shouldn’t be a problem. However, if your bag has flexible sides and expands when packed, then you should get one that is slightly smaller than the given dimensions. 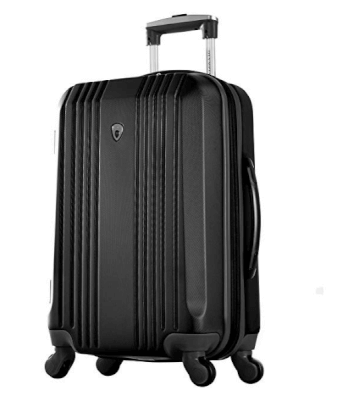 Rotatingwheels: The best carry-on luggage for international travel will always featurewheels. This is an absolute must for ease of use. Also, make sure that the wheels rotate a full 360 degrees to easily swivel and turn your bag as you move about. Wheels that only move in a straight angle will make changing direction difficult and can even strain your wrist. Extendable handles:Adjustable telescoping handles are another feature to look for so that you can adjust the handle to your ideal height. For most people, this should come to about their waist height, otherwise, you’ll have to stoop to pull which can cause a bad backache. Easy access: The best carry-on luggage for international travel will also feature extras and compartments to allow you to pack a variety of items. Some types to look for include a water bottle compartment, document or magazine pouch, padded electronics pouch and an external gear strap. The point is to look for a piece that eliminates the need to open the main compartment unless you are unpacking your clothes. Packing your carry-on the right way will make your travel experience all the more easier. Start offby keeping all your IDs and money in your carry-on to have on you at all times. If there’s any jewelry or valuables, these should also go in the carry-on and never in the checked-in baggage. Electronics and devices should be stashed comfortably in the appropriate pockets and pouches to minimize the possibility ofdamage. Longer flights can be boring so bring along items to keep busy, all packed in your carry-on. If all you travel with is a carry-on, then pack your towel and clothing at the bottom, where it can absorb the shock. Sort items by weight and place the bulkiest in first. Shoes can go in first, filled in with smaller items like socks and undergarments. Layer with folded clothes placing more fragile items in between. Top up with your electronics that may need to be taken out during security checks. Make sure that the dimensions of your carry-on piece comply with the airline’s requirements. There are also weightrestrictions on carry-ons so check these before you pack. International travel also restricts the amounts of liquids, aerosols and gels that travelers can take along in their carry-ons. Make sure to check with all restrictions beforepacking your carry-on. Even though your carry-on will be with you all the time, it’s still a good idea to have your contact details labelled clearly on your bag. Most luggage comes in the color black. Make yours stand out by choosing a different color. Or if you want to keep it black, then tie something on the handle to betteridentify it. Never pack your carry-on excessively as over packing will tax the seams and zippers. Carry-ons are a guaranteed way to preventlosing your luggage. After all, the airline can’t really lose something it never checked in. For this reason, some people are bigbelievers in travelling with only carry-on luggage. 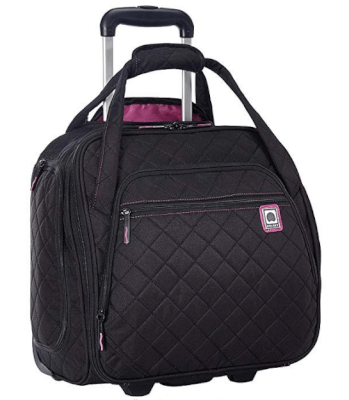 So make your travellightweight and easy with the perfectcarry-on luggagefor international travel.